Q&A: How can I check how deep water is in a body of water? Question by Calvin Nastyn: How can I check how deep water is in a body of water? 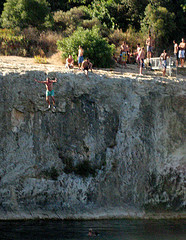 Alright, so i want to go cliff jumping with my friends sometime soon this summer and we want to jump off this huge cliff. We don’t know how deep the water is but we just want to take a rough estimate so we don’t shatter our bones if we do jump. The body of water is pretty small, about a ponds size, but it looks quite deep. Any ways of checking how deep the water is? Throw a line in it from the bank of the pond. With a heavy weight were you wish to dive in. Raise line on a pole. Triangulate the angles. This will give you depth of pond. Were you wish to land at. Don’t forget down angle. And length of line. pole height.